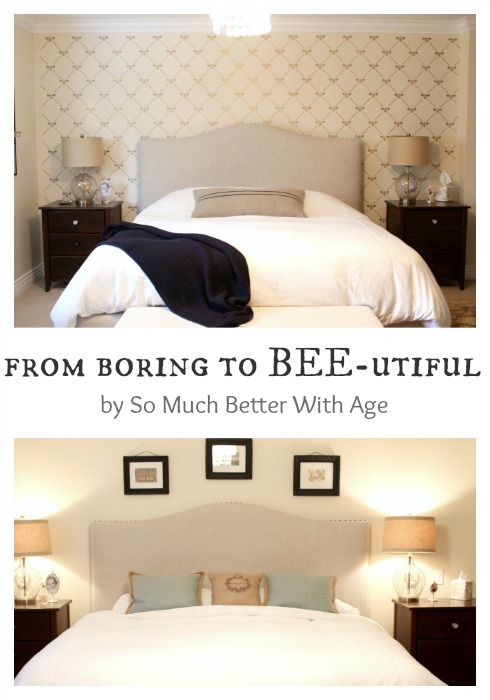 How I transformed my bedroom wall with a little paint and a bee-utiful stencil! Welcome to my master bedroom! You haven’t been around this room too much and that’s because it’s never felt quite finished to me. For one thing I’m a neutral color lover so it’s hard for me to go to a lot of color. For a long time now, I’ve been wanting to do something different to at least one wall in my bedroom. I really wanted to wallpaper the wall behind our bed. Now I don’t know how to wallpaper and neither does my husband. 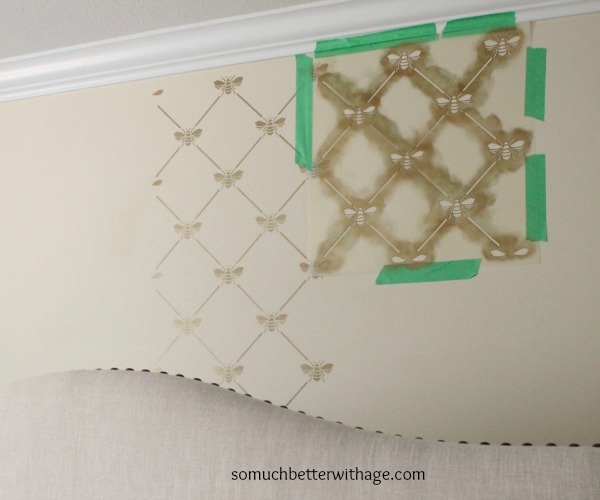 Being a DIYer, I’m sure I could figure it out but the task seemed a little daunting especially since we took down layers of wallpaper in almost every room in our previous house. What if we didn’t like the wallpaper once it was up?? Removing wallpaper again is a job I’d pass on any day of the week! 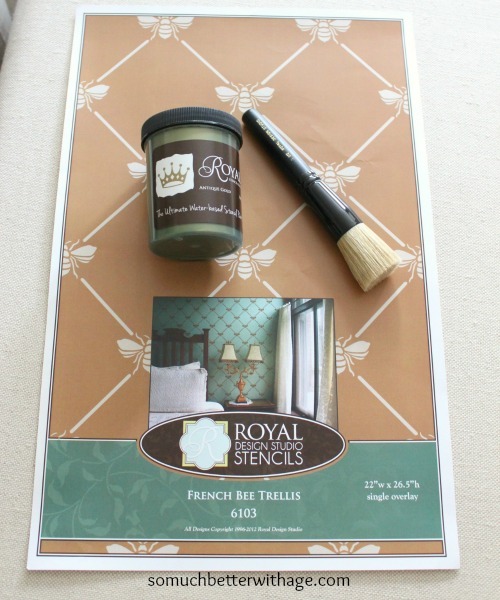 So when I came across Royal Design Studio stencils, I was amazed how much they looked like wallpaper treatment. At first, the phrase “wall stencils” reminds of something we all did back in the early 90s with emerald green ivy! If that’s your thing, no worries, it’s just not mine. What I really wanted was an allover wallpaper look without the wallpaper trouble. I was so impressed with the selection of stencils they had. The hardest part was choosing which stencil I wanted as there was so many good ones. 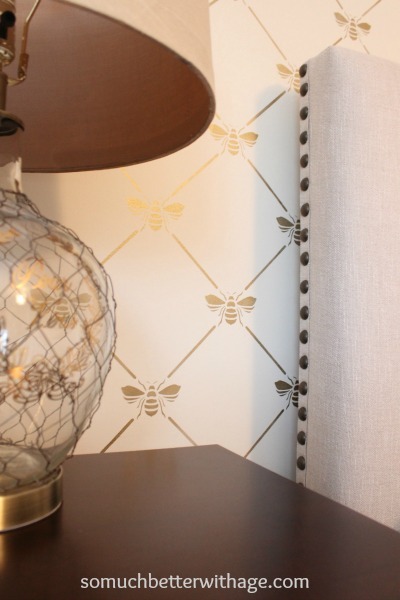 I finally chose the French Bee Trellis Stencil from the Allover Damask Stencils Collection. 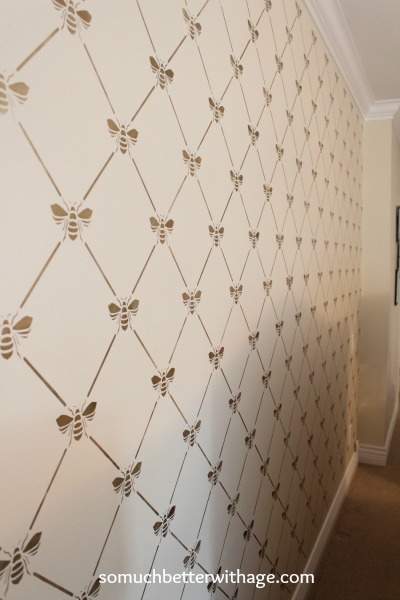 I also picked the Antique Gold Stencil Crème Paint and 1.5” Stencil Brush to complete my “wallpaper” look. The stencil is HUGE which is awesome as it can cover an area quite quickly. You can see it holds up easily with painter’s tape. The stencil comes with instructions on how the different paint techniques and how to stencil! 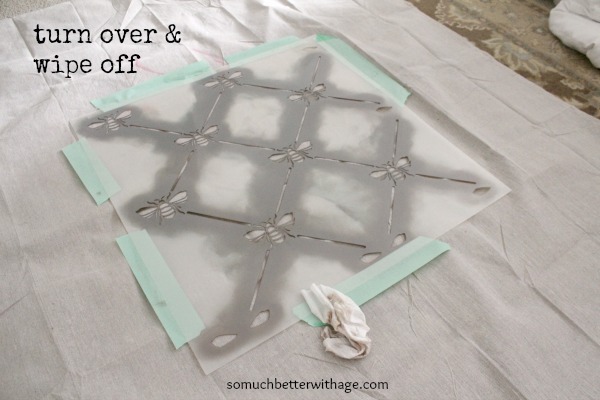 There are easy placements on where to overlap your stencil so there is no guessing. They suggest you start in the middle and work your way out so that’s it’s a nice and even fit on your wall. Even the corners weren’t that hard to do. Just bend and tape into place. Halfway through my stencilling job, I placed my stencil upside down on a dropcloth and wiped off the back just in case some of the paint had bled through. It wasn’t that bad but some paint had come through so it’s a good idea to do this at least halfway through your stencil job. You can decide where you want to end your stencil too. You can see on the far left how I ended my paint job. So it took me approximately 2 1/2 hours to complete this wall. It was my first time stencilling too. The actual stencilling is the easy part. It’s only the set up that takes some time. Once I got the hang of it, I was on a roll and it was really fun to do. I love, love, love it!! It’s makes such a huge difference to our master bedroom now. And I highly suggest buying the creme paint with the stencil. 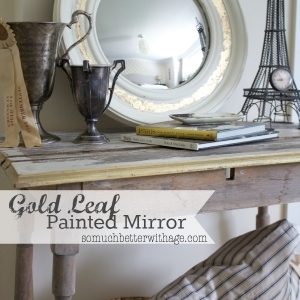 If I had used a regular type of craft or latex paint, It would not have these gorgeous results! And with the dry brushing technique, you need very little paint. A little pot will do! The shimmer off the gold is gorgeous! Now it’s time to finish off my master bedroom with some new pillows!! Disclaimer: These products were given to me by Royal Design Studio. All opinions are 100% mine. Love how it turned out! i was just looking at that pattern. i love working with Royal Stencils – just finished up my mudroom http://cherneeshouse.wordpress.com/2013/09/30/even-a-mudroom-needs-a-facelift/. 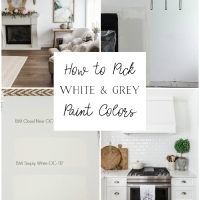 I have not tried there paint – how did that go? Oh. My. Gawd. Like I said, I want to come stay at your home and pretend it’s a B&B. 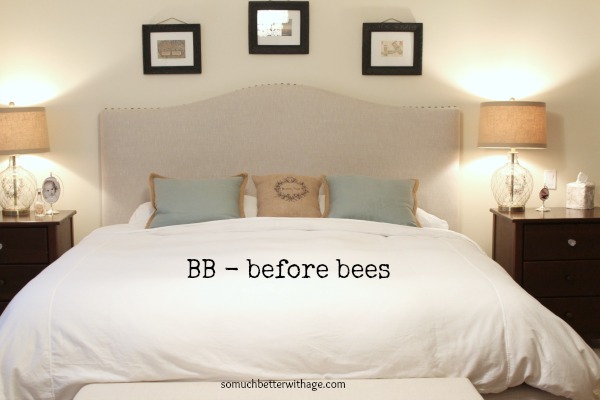 I’d like the Bee-utiful Bee Room at the B&B, please! haha, you’re welcome to come over anytime, my dear! Oh Jamie – it really is BEAUTIFUL! 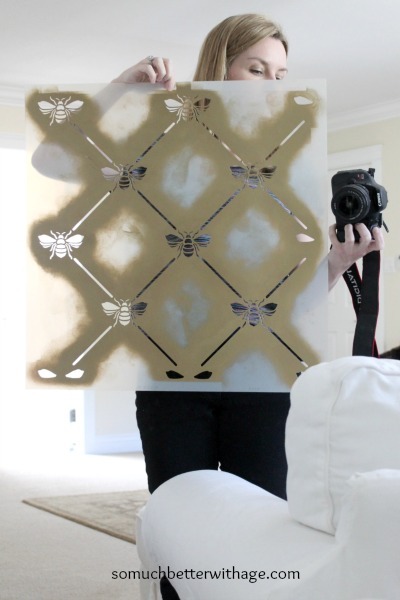 The bee stencil is so unique and came out wonderfully! Side note/fun fact: Royal Design Studio is just down the street from my home and it’s where I purchase my ASCP. They are great! Jamie! I love it! I didn’t know if I would like the bees, but it is fabulous! And of course, I love the gold paint! I’ve got to get on this stencil train! Looks fantastic and one of a kind!! Thanks so much, Luisa. I just love it. I love how this looks, Jamie! I’ve been kicking around doing this myself since our master bedroom is at a “I hate it” stage since we moved up to a King size bed. I feel like I’m starting over again getting it to where I love it again. 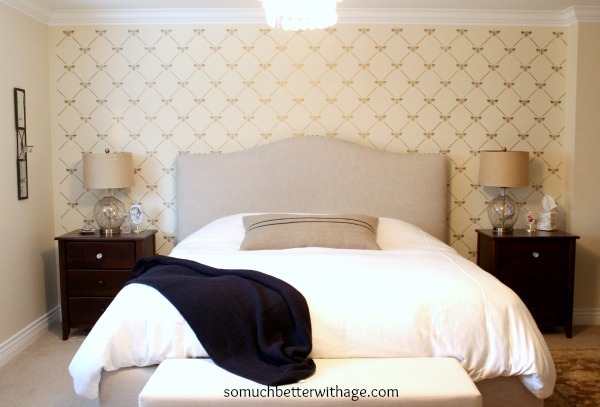 The bed wall is something that needs addressing and this would be a great way to go. Thanks for stopping by, Kathy! King size beds are awesome for sleeping but hard for decorating as they take up so much space. I’m so happy with my stencilled wall. I can’t believe what a difference it makes. It just seems to make the room more “done” or cozy. I’ve found the master bedroom difficult to decorate too but I think I’m almost there now. Jamie, the wall looks gorgeous and what an amazing job you did! 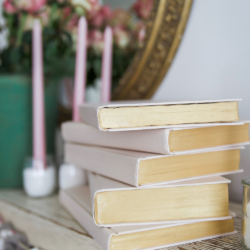 I would love to try and stencil a wall, if it could turn out as stunning as yours did! Love it! 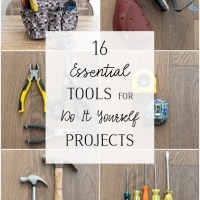 Thanks for sharing – pinning and sharing today! Have a happy Friday and a fantastic weekend! OMG! This is a focal wall! It looks amazing. I have to admit I was apprehensive about the bees. You see, I have a love/hate relationship with bees. Our builder landscaped our front yard with bee bushes lining the walkway to the front door. They are full of bees! Our boys are scared to walk by them. But, your adorable bees have me loving them again! That stencil is ridiculously cute! Great job Jamie! Thanks so much , Shannah! I absolutely love this, Jamie! 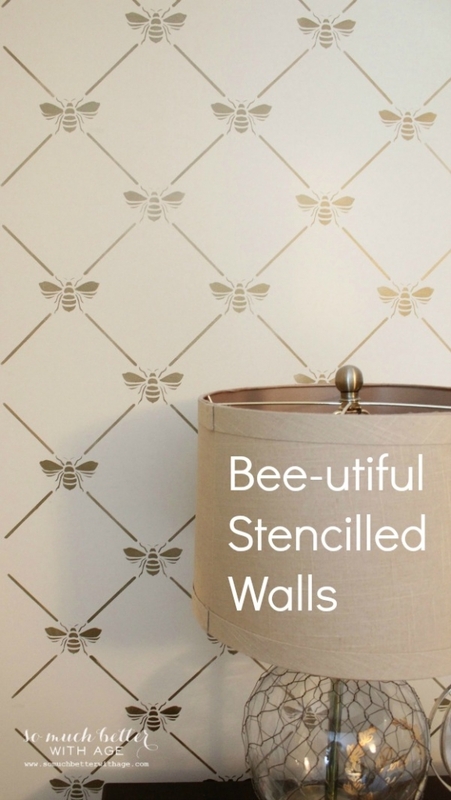 I would have probably overlooked the bee stencil, but it is really gorgeous! And the creme paint is the finishing touch. Just bee-utiful!! Sharing on Pinterest and Facebook later this week! Thanks darling! Yes, I love my french bees 😉 Thanks for sharing!! What a huge difference….I absolutely love the transformation ~ so elegant! Thanks so much, Mary Beth. Wow what a beautiful stencil and the finished product looks amazing! Looks fantastic – I love it! Almost looks like wallpaper. I love this! The bees are fantastic! Wow I love it!!! 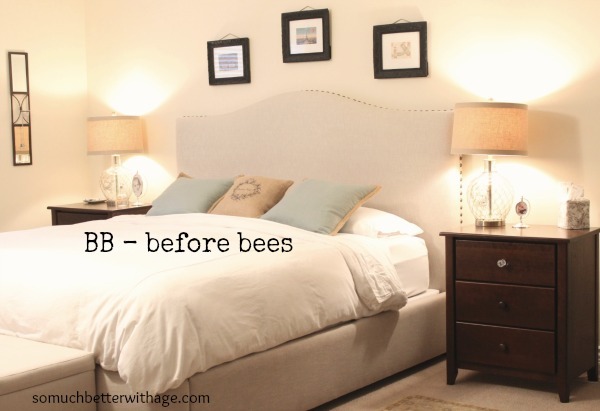 The bees look so elegant it changes to entire look of your bedroom! What color paint are the walls behind the bees? Love it! Hi Teresa, I thought of that after, I’ll be sure to update my post! The wall color is Cozy Cottage by Behr. Jamie, what a sophisticated transformation! 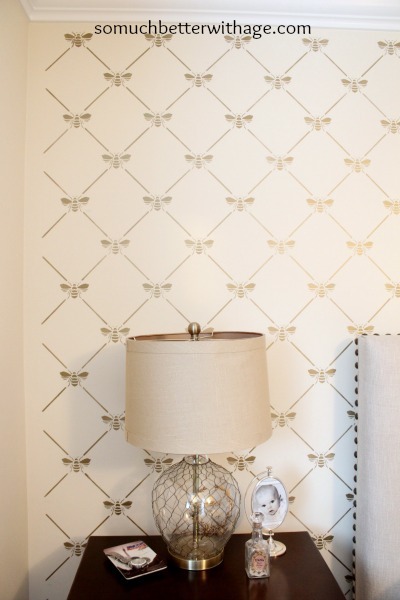 Those bees really add the right touch to your space. Kudos to you for tackling that project! WOW that is absolutely STUNNING!!! 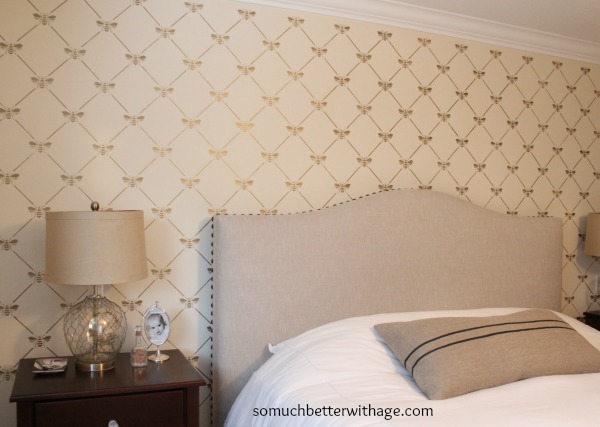 What a transformation, the wall and room look gorgeous, and I love that the stenciling looks beautiful both up close and from a distance, I feel like that’s not always the case, but this looks absolutely BEAUTIFUL! Thanks so much, Maria! I’m surprised myself at how well it turned out! The paint is the key! This is fabulous! 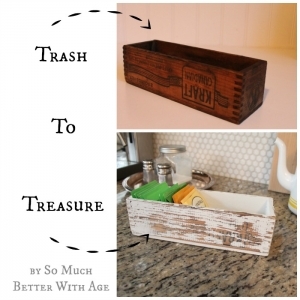 Saw this over at Jennifer Rizzo’s blog! Great job! That looks gorgeous! 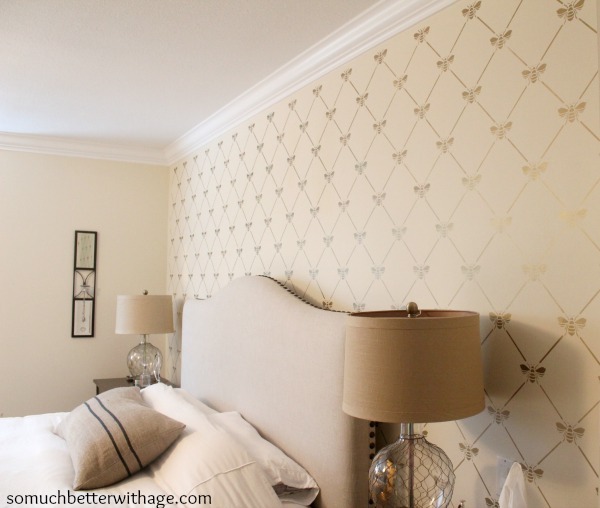 I’m featuring your stenciled wall in this week’s Power of Paint Party. Thank you SO MUCH Maryann!! It looks absolutely amazing Jamie!! I am so tempted to try a stencil myself! Thanks so much, Krista 😉 I’m honored! Thanks so much, Aniko. I love your parties! I have been thinking of doing something in my kitchen. Looking at any and every theme I could think of, Tuscan, coffee, grapes, etc. I decided to look into bees and honey. Then I stumbled upon this. I think I am hooked; this stencil is easy, relaxed, subtle, striking, just what I was thinking of for my kitchen. Thanks for the inspiration. 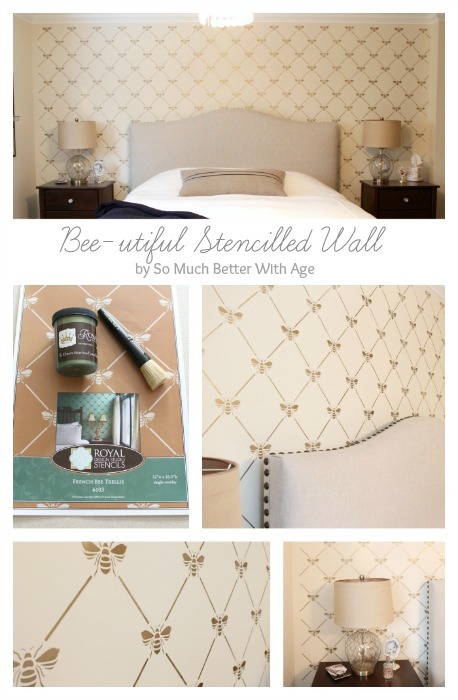 Now to get busy with ripping down wallpaper and getting that beautiful shade of wall paint on the wall and ordering the bee stencil. 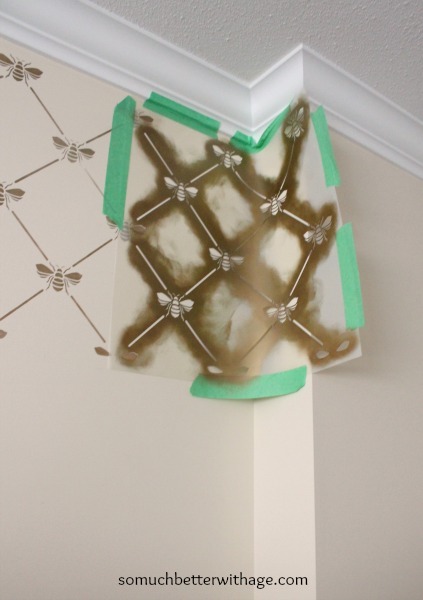 Bees would look amazing in the kitchen! I think they have a smaller one too than the one I used which might be good for your kitchen space depending on how much wall space you have. I also REALLY love the gold paint. There’s a shimmer to it that makes it look like wallpaper almost. Good luck!! What paint did you use for your base, I love this look!